daily life. This can cause muscle soreness. Muscle soreness is an unusual stiffness of a muscle that can come along with pain and a strength lessening. Muscle stiffness generally appears a few hours after effort, whereas pain comes from 2 to 4 days after. Muscle soreness effects slowly diminish within a week. What are the causes of muscle soreness? A muscle is composed of muscular fibers, and thanks to those one can produce some effort: they are very flexible and extendable. Those fibers are contained in many sheathes called aponeurosis, they are quite rigid and non-extendable. During effort, if the muscular fibers are having difficulties to cope, for example if the effort to be done is too big, they will cause an inflammation and secrete a liquid, lactic acid that will lead aponeurosis to inflate. This inflation is the main cause of muscle stiffness appearing during and just after the effort. The inflated muscle is also less powerful since the fibers are weakened and less mobile. Lactic acid is almost completely drained off about 1 hour after effort. If the effort is too big, some muscular fibers can break and aponeurosis can be subject to minor tears. Don’t be afraid, it doesn’t mean that you broke your muscle! This process is completely normal: The muscle will rebuild a broken fiber with a stronger and more resistant one; it can also create new fibers and enlarge the aponeurosis. This is the basic process when you go to gym. One forces in order to break the fibers and tear the aponeurosis to constrain the muscle to rebuild stronger fibers, enlarge the size of the sheathes and as a result create a bigger and stronger muscle. Fibers are very well irrigated by the blood that brings them all the needed nutrients, so naturally, when one fiber breaks, it bleeds. A muscle whose fibers are broken was necessarily under heavy loads and as a consequence the fibers have produced lactic acid. When mixed with blood, it will make the pressure in the aponeurosis rise, which will in turn push on the nerves and trigger pain. This pain disappear when the lactic acid is drained off but comes back a few days later when the fibers are regenerating: Indeed the blood is much harder to drain off than the lactic acid. As a result, when the fibers are regenerating with blood still inside, the pressure in the aponeurosis rises again, and the nerve transmits a pain signal. The blood is completely drained off after a week. During and after an effort requiring a great amount of stamina, it may happen that the muscle lack sugar (glycogen). In this case, fat (lipid), as well as some other components of muscular fibers (proteins), will be used as a fuel. One could say that once the muscle lacks sugar, it consumes itself which damages the fibers. In that case, pain can actually appear a few hours only after the effort. How to avoid muscle soreness? It can be fought at three distinct moments: before, during and after the effort. Before the effort, we’ll limit the creation of blood and lactic acid in the aponeurosis thanks to a good warm-up. Indeed, when the muscle isn’t used, it isn’t correctly irrigated by the bloodstream. Considering that, if one starts an effort suddenly, muscular fibers are more likely to have difficulty to cope, and so they will produce lactic acid or maybe even break and bring blood into aponeurosis. The warm-up "warns" the muscle that it will have to produce an effort and as a consequence blood will bring more nutrition. Warm-up is short and efficient; therefore it would be a shame to skip it. You just need to jog around, moving the arms correctly during 2 minute, breathe correctly and with getting out of breath. Most muscles of the body will be then ready for the effort. During the effort, we’ll help the muscle to work correctly by giving it everything it needs. If your training is long, plan energetic bars so that you won’t run out of glucose. Whatever the length of the training is, it is also important to drink often: Muscles use water to work and evacuate heat. After the effort, when it is the most important, we will help the muscle to release the lactic acid and blood from the aponeurosis. Once the muscular fibers are damaged, the muscle loses its elasticity liquid retention is favored. Stretching is very efficient to help the muscles regain their elasticity and thereby eliminate a major part of liquids. It is therefore advised to have some stretching workout at the end of training; it takes only 10 minutes and can be very efficient, if done correctly. 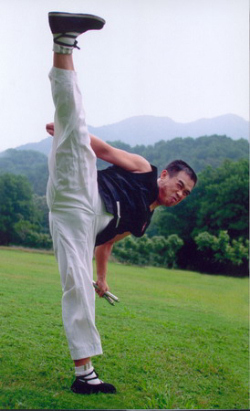 You will find hereunder some exercises to stretch the main muscles used while practicing Nunchaku. Some movements can be uncomfortable and/or painful but that is absolutely normal, don’t panic and do them just as described. Join your hands in your back, the lower arm pulling the upper one downwards. Stay in this position for a minute, change side and do it again. You may be not flexible enough to succeed joining your two hands. In this case use a towel or a rope to fill in the space between your 2 hands. Flexibility will come gradually. In this exercise, keep you chest straight and don’t turn your head. While at elbow level, press in order to push your arm backwards. Keep this position for 1 minute and switch side. 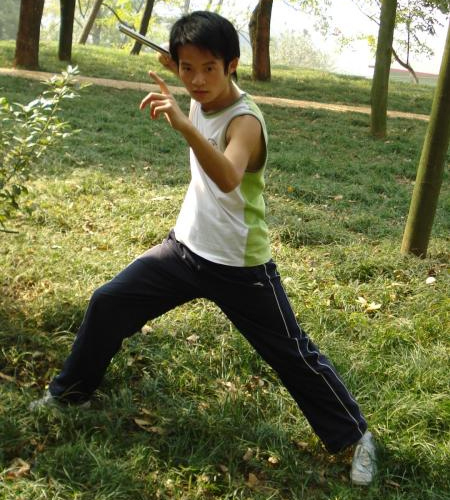 Wrists are forearms are the most used body parts while practicing Nunchaku. You must therefore consider that stretching exercise as the most important one. Put yourself in the same position than on the picture with palms facing the ground. Move your weight on your arms until you feel a reasonable stretching feeling in the forearms. Keep the position for 1 minute and 30 seconds. Then, do the same exercise with the back of the hands touching the ground. This will mainly stretch the top of the forearm and the wrists. However be careful not putting too much weight on your arms since in this position, the wrists can be at risk. Keep the position for 1 minute. Palms facing each other, keep a straight position, don’t lean and don’t arch the lower back too much. Pull then your arms as if you wanted to touch the sky. This exercise stretches mainly the shoulder but also all arm muscles. This exercise is also very relaxing. - Never do short stretching, they all should be between 3 seconds and 3 minutes to be efficient. - It is also important to drink water when stretching. - Small one-handed massages are also very efficient against stiffness and complement stretching in an efficient way. - Don’t train hard every day of the week, don’t forget that your muscles need to rest in order to rebuild themselves. Therefore 1 or 2 days rest between each hard training is a good thing. - Be careful not to train if you are hungry. Before intensive training eat preferably dishes providing vitamins, proteins and sugar.